You want to know what the weather was like in Flanders today? 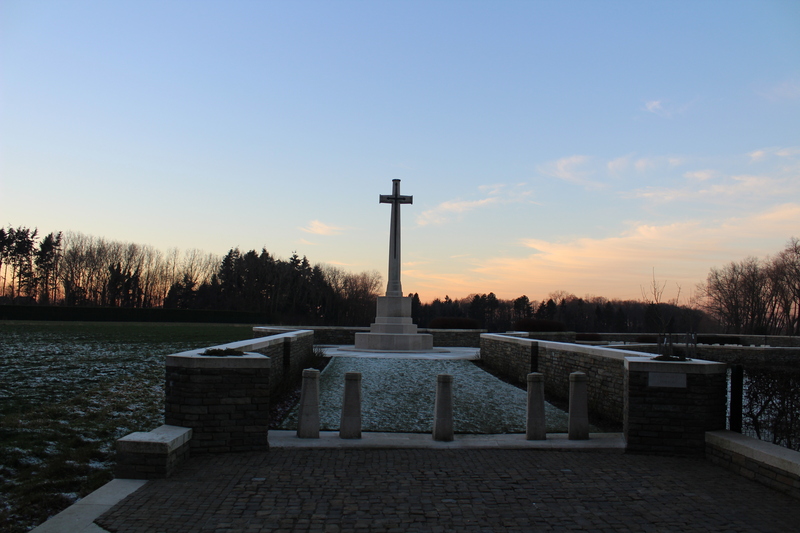 Allow me to introduce you to the first clouds of the day, as the sun sets over Polygon Wood Cemetery. A mere 710 photos taken on day uno with the new camera. Tomorrow, across the border to Erquinghem-Lys, and then we head for Laventie. More of the same, please. This entry was posted in The Road to Passchendaele - Third Ypres 1917. Bookmark the permalink. Honestly Sid, amazing weather again today. I am soooo lucky. Nearly everywhere we went to today was new territory for me, and we managed to get to all the stops on my list by sundown, plus a few extra French war memorials on the way. Another wonderful day. For you information, the 710 photos I took today were with the old camera with new lens, for comparison purposes. And the light today was just perfect. Anyway, home tomorrow. And maybe a quick return to Hooge in the morning – my third visit was yesterday, but it was the first time I have had the chance to spend the required time there – I now have all the photos I need to be able to write a tour of the cemetery. Apart from one. Unfortunately I failed to find the VC there, hence the possibility of a return in the morning if I get up in time!